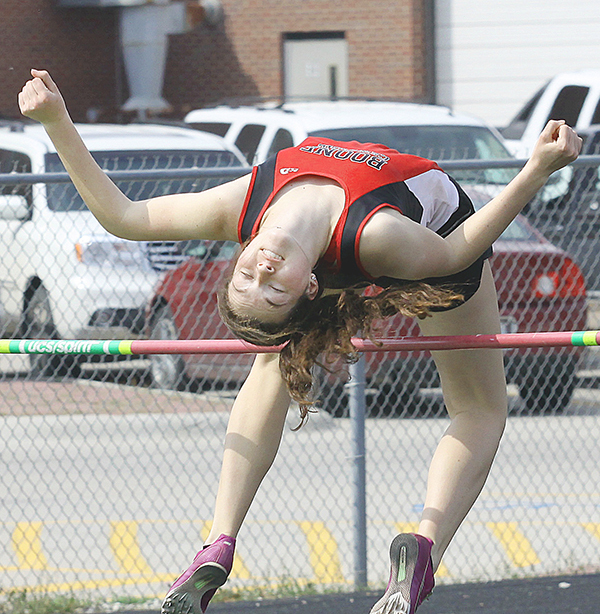 The best weather of the young track & field season and a host of high-caliber competition spurred Boone Central/Newman Grove athletes to 26 season-best performances in Thursday’s annual Central City Invitational. Competing against traditional track & field heavyweights Northwest and York, along with St. Paul and host Central City, the Boone Central/Newman Grove girls placed 4th and the Cardinal boys 5th in team competition. The Cards were led by gold medalists Leighann Miller (discus) and Katie Goodwater (3200 meters) and produced 20 placing efforts in all. Dalton Wagner took 2nd place in the shot put and teammate Jessie Sullivan was runner-up in the discus and 3rd in the shot. Jenna Kramer placed 2nd in the high jump and the girls 4×100 relay team of Tessa Hedlund, Kramer, Lauren Hedlund and Niah Kahlandt took runner-up honors. Cody Nelson was 3rd in the high jump and Kelsey Thompson earned places in four events (4th pole vault, 5th 200, 5th 400, 6th 100).